if your text goes to wide, or long vertically. The trick to this technique is to contain the words within the image! Using non-repeat code combined with this technique does not work. Or use a very small image and purposely allow it to repeat inside the table! The links inside these tables are static. They stay the same as you mouse moved over them. The links inside these tables are rollover links. You can place just plain text in a table that has an image background. It does not have to be linked to anything! This is nice as a special item you want to show well. NOTE: this technique can be done without text and links! See notes on the code! The links inside these tables are rollover buttons. They change as you mouse moved over them. NOTE: Create a watermark image easily in a photo program by adjusting the brightness/contrast setting or using the Layer opacity setting. See an example of the Layer opacity setting in PSP on bottom of this page. Make a table in CSB. Set the cell spacing and the padding to 0. Place this script into an Insert > HTML (webgem in Trellix) inside the table. Center the webgem. Include the image in the webcomponent. Change BLUE items to your image name and size. Change NAVY items to match your font colors and sizes. Change RED items to match your links. I have made notes in codes below and it will effect functionality! This first code says how the links will look regular and on rollover (hover). I have underline turned off, text bolded and change to CAPS (uppercase) on rollover. The colors I use in the sample are blue with a change to green on rollover. 2) Make a table in CSB. Set the cell spacing and the padding to 0. Place the second script into an Insert > HTML (webgem in Trellix) inside the table. Change RED items to match your text. Use the Select All choice above to copy code! 1) SKIP THIS STEP IF YOU DO NOT WANT LINKS ON THE IMAGE! 2) Make a table in CSB. 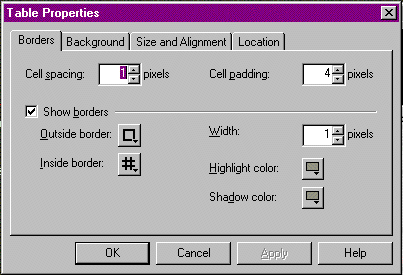 Set the cell spacing to 1 and the padding to 4. Note: the cell padding will determine how wide the outermost fill color will be. I used 4 so the outer fill is quite thin. The Table background color for the outermost fill is set here. I chose WHITE as my color. Include the images for the 2nd and 3rd layers in the webcomponent. Change GREEN items to your image name and size for the 2nd Layer. 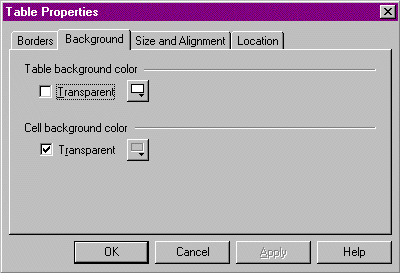 Set table and image to same size. Note: The blue background image is only a small block, but setting the image size stretches it to fill the large table. 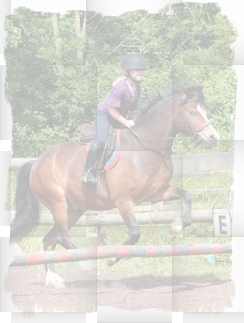 You have to know the innermost image size (my horse picture) that is used in the 3rd layer to calculate the 2nd layer. Change NAVY items to match your font colors and sizes for text. Add or remove <bR> to push text down or move it up. Want the picture with no links or text? Just leave out the code bracketed with START STOP notes! Change items to match your font colors and sizes. This first code says how the buttons will look regular and on rollover (hover).